Is the Blue Lake safe for swimming? Yes it is. The beach directly over from Blue Lake TOP 10 Holiday Park Rotorua is very safe for swimming with a gentle grade into a clear, freshwater lake. The beach is great for families and young children and there is also a pontoon that can be enjoyed as well. Jet ski’s and boats are not permitted to operate in this area as the lake is zoned for passive craft (under 5 knots) only. On the opposite side of the lake, adventurous walkers will come across a beautiful secluded beach which sometimes leads you to think that you're on ‘an exotic island paradise’ with majestic ferns overhanging the lake edge. Is the Lake suitable for water skiing? Blue Lake is perhaps one of the best of the 14 Rotorua Lakes for water skiing. A newly installed concrete boat ramp makes for easy launching of boats. The stretch of water along the south side of the Lake is invariably always sheltered and for those skiers capable of early morning starts, the entire lake can provide some of the best water skiing found in New Zealand. Water skiers will need to be aware that the take off and drop off point is opposite to most other ski lanes – this is due to the setting of the sun over the ridge which can make it difficult if normal practices are followed. All boat users are reminded that when operating a craft on the Lake that the boat must travel in a clockwise direction and outside of the 5 knot areas. Ski Lanes are clearly marked and there is good parking for trailers. Blue Lake can be very busy with boats over the Christmas period. February and March can provide excellent conditions for skiing and the weather is still great! Do Trout live in the lake? Yes they do – there are 2 varieties of trout that exist in the Blue Lake – Rainbow and Brook Trout. Anglers are reminded that a Fishing Licence is necessary to fish in the Blue Lake. 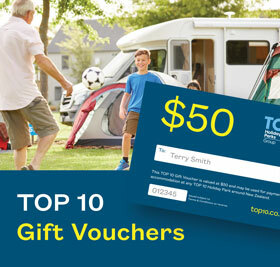 These can be purchased from the Blue Lake TOP 10 Holiday Park Rotorua office. As there are no streams that flow in or out of Blue Lake, the trout are considered to be biologically slightly different to their counterparts in nearby Lake Okeraka or Lake Tarawera. Instead of spawning upstream, trout lay their eggs amongst the grassed edges of the Lake – it is in this area that anglers often fish at the change of light. Although trout fishing is possible all year round, the best time of year is when the cooler weather is approaching. The signs of the first winter frosts and declining lake temperature can result in adding to your chances of catching that elusive fish!! For those customers who are keen on fishing but do not have their own equipment, we can recommend and book a pleasurable fishing experience with a reputable and experienced fishing guide. Are there any good walks in the area? The most popular walk is of course the Blue Lake Walk – this walk starts from in front of your Blue Lake accommodation and follows an easy trail of approximately 5km. The track meanders along the lake edge and through a 90 year old Douglas Fir forest. Along the way, there are great places for swimming and relaxing. For those keen on running, the Blue Lake track is an excellent option for that early morning run before breakfast! An evening option is to take a torch and seek out the glow worms which can be found in bush along the track. Other tracks can also be found in the area – for details on these tracks, please ask our office staff for details. How many cars can we bring when we make a booking? Maximum number of cars in a booking are limited to two, this is to ensure everyone staying at the Holiday Park has parking and doesn't get congested. If you have family or friends visiting and require more parking there's parking outside of the Park. 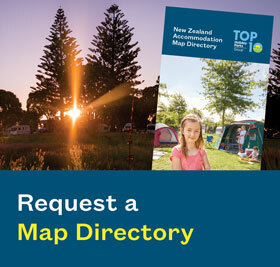 The Holiday Park is surrounded by native bush and consequently we do not have any neighbours. The Park has a strict quiet time from 10.30pm to 7am and staff is on hand 24/7 to ensure that any problems that do arise are quickly dealt with. Can you help with suggestions on what to do? We most certainly can. 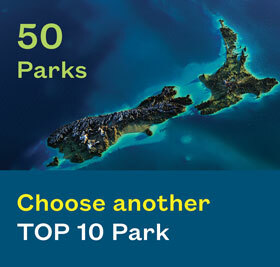 All staff have a comprehensive understanding of the attractions on offer within the Rotorua region. Our office displays brochures of all of the most popular activities and we are happy to discuss with you suggestions on what to do. If you require us to make a booking for an activity, then we would be pleased to make the necessary arrangements. We can offer wet day alternatives for keeping the kids amused as well. If you have any questions or queries you would like answered, please do not hesitate to contact us by email.